Canada enjoys one of the safest food systems in the world. A 2008 international food safety review ranked Canada 5th among 17 member countries of the Organisation for Economic Co-operation and Development, identifying it as a superior system. Most foodborne illnesses in Canada result from an individual consumer's improper food handling, cooking and storage, but outbreaks from commercial sources also occur and have the potential to affect a large number of people. Large scale farming and food processing as well as access to foods from around the world all contribute to increased opportunities for contamination. These trends make it harder to trace the source of a foodborne illness than outbreaks linked to local food sources. Outbreaks such as listeriosis from contaminated deli meats, which resulted in serious illness for 57 and the death of 22 people in 2008, do not happen often in Canada. However, the number of listeriosis cases has increased in recent years and the Independent Listeriosis Investigative Review found that industry and government both needed to implement changes to ensure that a similar tragedy doesn't happen again. 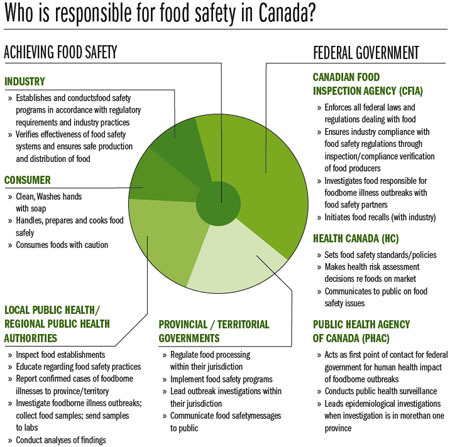 The federal, provincial, territorial and municipal governments (and/or regional health boards) have shared responsibility for food safety in Canada. The food processing sector has legal obligations related to the production and sale of safe foods and consumers also have a role to play. Source: Report of the Independent Investigator into the 2008 Listeriosis Outbreak, p. 15. Over the past century, public health inspectors have worked diligently to prevent and control the incidence of foodborne illness across Canada. At the local level, public health inspectors enforce provincial/municipal legislation by conducting regular compliance inspections of retail food premises, investigating reported foodborne illnesses, addressing public complaints, monitoring food recalls, and educating operators and the general public. Public health inspectors are dedicated to safeguarding the health of all people. The Canadian Institute of Public Health Inspectors (CIPHI) advances the profession, science and field of Environmental Public Health through certification, advocacy, education and setting standards. Public health inspectors are committed to protecting the health of Canadians and CIPHI represents environmental public health professionals across Canada. The Environmental Health Foundation of Canada (EHFC) is a not-for-profit organization for advancing environmental public health in Canada and internationally through education and research initiatives. The EHFC was set up in 1989 and became a registered charitable organization under the Canadian Income Tax Act in 1991. The EHFC is the education and research arm of the Canadian Institute of Public Health Inspectors.